My grandmother designed hats for Hollywood celebrities including Mae West. My mother used to sew clothes for me, which was really fun. I hovered about while she sewed. I particularly remember and loved the purple yoked muumuu she made for me. And then there was the olive green corduroy jumper that I wore with a powder blue shirt underneath. The creative genes passed on to me manifested at age 11 when I designed and made my first dress. One of my first jobs was sewing bell bottom pants for the Electric Pants Shop in Los Angeles. The Epicenter opened in 1990 in the tiny town of Olema, the historical epicenter of the 1906 earthquake, hence the name. Epicenter moved to Pt. Reyes Station in 2010. I make the clothes from concept, pattern making, and sewing in my home studio. Vests, t-shirts, sweaters, tunic tops, pants, leggings, skirts and dresses are some of the clothes I make for Epicenter. 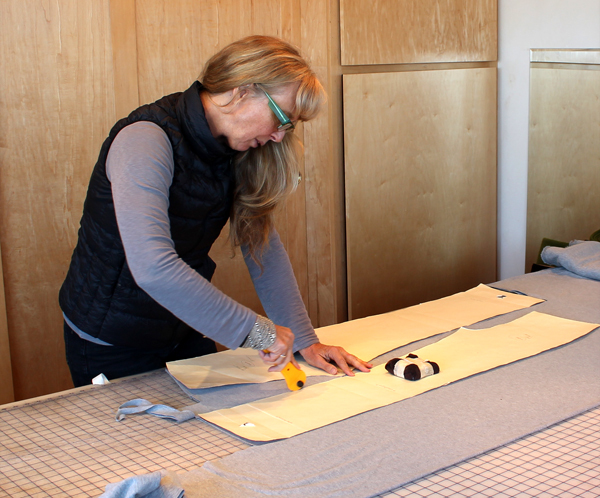 My assistant Jane and I cut and sew each piece using mainly European fabrics. I’m using boiled wools from Holland, France and Italy for my famous vests and jackets. I’m using French and Italian rayon and viscose for my tunics and tee shirts. For pants I use stretchy natural fiber lycra blends. All of my designs are comfortable, flattering and classy in a “You Want to Wear Them Every Day” kind of a way. The Dana Davidson line is only available at Epicenter in Pt. Reyes Station. Made in Nicasio, West Marin, California. Here are some of my designs. Come try something on. Click on images to see them larger.